As MRO approaches its first Martian year of science operations, from November 2006 through November 2008, one of the key activities of the CRISM team is preparing for "cover opening." When CRISM was being built, tested, and integrated onto the MRO spacecraft, cleanliness was Job 1. The same was true for all of the optical instruments on MRO - CRISM, HiRISE, CTX, and MARCI. As any camera user knows, keeping dirt off the lens is of first importance for taking clear, sharp pictures. For example, the picture below shows CRISM being tested after it was built. The engineers working on it (1) wore "bunny suits" to contain loose hairs, skin flakes, and sneezes. The opening in the telescope was covered with a bag made of special plastic (2) to keep out dust. And a small plastic tube (3) was attached to the instrument to blow ultra-clean nitrogen into the interior to "push out" moisture from the air. Cleanliness is even more critical with CRISM because some of the wavelengths of light measured in its hyperspectral images are particularly sensitive to the tiny amounts of water or organic material in airborne dust and chemicals. 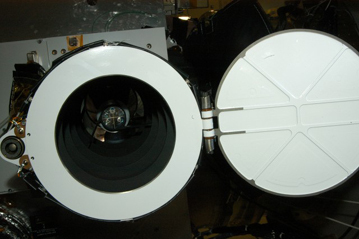 So CRISM has gone a step further than the other optical instruments on MRO by including a one-time deployable cover over the telescope (below). 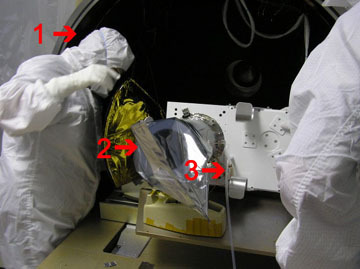 Many spacecraft optical instruments use covers like this because once the spacecraft is on its launch vehicle, the countdown and launch can create a surprisingly dirty environment. So does the early part of interplanetary spaceflight. Rocket exhaust or chemicals that boil off a spacecraft in the vacuum of deep space can condense into a film on camera optics and make the images blurry. That actually happened on the NEAR and Stardust missions. CRISM's cover has stayed closed since launch to protect the optics during the major burn for Mars Orbit Insertion, and during aerobraking when the spacecraft body gets heated and volatile chemicals may be driven off. The scheduled day for cover-opening is September 26, 2006. CRISM will turn on the previous day and undergo a series of tests to be sure that engineering functions are nominal. Then, while Mars is being imaged, the cover will be deployed half-way through the image. Mars popping into view provides the ultimate validation that deployment went smoothly - literally, "first light."